DougBeyer.com | A blog about writing and food. A blog about writing and food. The number one reason I don’t write is not wanting to. I am a delicate flower, and writing can stir up all kinds of uncomfortable neuroses in me. It is an unhealthy circuit of perfectionism, procrastination, and cupcakes. However, when I’m at my best, I’m able to turn that circuit inside out. I sublimate all the crazy-person thoughts and emotions that tornado around me and turn them into an engine of creation. The good news is that fears are human. Fears motivate behavior. Fears generate conflict. As long as you have anxieties (and congratulations, you do), you have no reason to run out of ideas for your characters. Try this method the next time you’re building a cast of characters for a story. Instead of writing a list of descriptive traits for each character, use your constellation of writing anxieties to drive all your characters. Let’s take an example of a short character bio of a typical space opera hero. A smart, dashing spaceship captain. Valedictorian at the academy. Chosen to helm the Starmosey thanks to his big brains and big potential. Crack shot with a electrofizzler. Has a dark secret that only his earthbound sister knows. This is fine, but a little flat. I find this kind of bio doesn’t really get me back to the word processor. He’s just sitting there. He seems clichéd, and it’s partly because I’ve written him that way, but it’s mostly because we haven’t actually met him yet. We’re just being told a list of facts about him, passively—and that’s part of why we get uptight and don’t return to the project. Remember the audience of your own notes is you. Why are we talking to ourselves like grocery lists? Instead of a list of descriptions, try writing the character bio as a list of instructions to yourself. Use the imperative voice—these are commands. Tell yourself what to do with the character. The point of this bio isn’t just to figure out what the character is about. It’s to help you get excited about writing the story. Make him larger-than-life. Crank up all his accomplishments and accolades—maybe open with a scene of him at an awards ceremony, or during his promotion to captain. Get him in an over-the-top dangerous situation early and show him excelling—maybe have him take a risky shot with an electrofizzler and lives to tell the tale. Give him a dark secret—one he really worries about. For me, this is already tons better, even if it doesn’t supply much more information about Captain Freddy. The imperative voice helps propel me from mere brainstorming into real-live, actual writing. It turns a short character bio into a very fun to-do list of checkboxes (I mean, who doesn’t want to obey an instruction that says “get someone in an over-the-top dangerous situation”?). This sort of bio won’t just motivate your character—it’ll help motivate you. Now comes the fun part. You know that halo of phobias and panics that accompany you to the writing desk? They’re secretly your friends. Don’t try to banish or ignore them. Use those fears to breathe humanity and action into your characters. Create huge expectations for him, based on his brains and potential coming out of the academy. Maybe have some war hero say he’s going to be the best captain in history. Put all of your insecurities about your own abilities into Freddy. Let him envision how great it’ll be to ride in as the captain who just saved the galaxy, just like his idols in the old ElectroFizzler vid series—and just like you dream about being a celebrated writer. Make him worry about being seen as a fraud, just as you worry about others thinking you don’t know what you’re talking about. In fact, give him an opportunity to lie about his achievements and play the hero. Give him a dark secret—that he isn’t a brainy wunderkind at all, that his test scores were inflated, or that he’s there because of an identity swap, like your fear that you don’t deserve what you have. See how Freddy’s coming alive now? It’s all thanks to your writerly mental illnesses! You can use this trick with all of your various yearnings and worries—your fear of having your secrets shown to others, your simultaneous fear of dying without having your voice heard, your fear of hurting your family’s feelings, your fear of being seen as a character-torturing sadist, your fear of having your delicate artist soul exposed—all of that good stuff. That is prime humanity right there, rich and raw. And it’s what your readers hope to find in your characters. 1. Shows you will have delivered to you, watch, and return. 2. Shows you will have delivered to you but never watch, or shows you will never have delivered to you. Why do we queue up movies we won’t watch, or won’t even have delivered? Are we trying to impress someone? Are we trying to fool ourselves? Are we trying to change our own habits? Are we trying to improve our movie-watching? By what standard? And is it working? The Netflix queue is a case study in perfectionism. It shows how we let our inner critic create guilt for us, which stops us from doing what we actually want to do in our lives. Here’s the thing: your actual movie-watching habits are already perfect. Netflix, like the entire universe, is there to let you do what you want to do. It’s a service that robotically delivers exactly what you ask for. So don’t try to impress the machine by delivering Hotel Rwanda to your house, if you know you’ll never be in the mood to actually watch it. Bubble up a show that interests you. 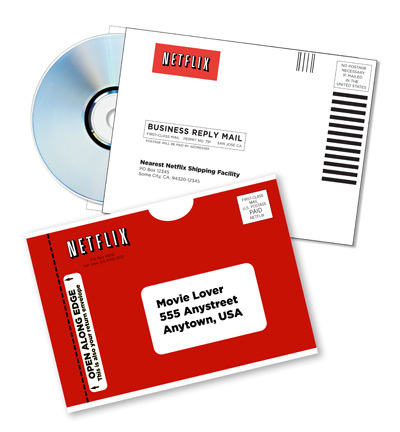 Have something delivered that makes you eager to rip open that red envelope and make a batch of popcorn. I’ve been working on notes and ideas for a new story for a few weeks, and I’ve noticed a kind of “Netflix guilt” guiding my story. I’m writing about what I feel like it should be about, rather than what excites me. I fall into a pattern of making it about the Big Serious Drama of Life, and find that my mind wanders and instead of writing I go fiddle on the internet or play games on my phone. It’s because I’m letting my inner critic dictate the writing instead of joy. I’m not eager to return to my writing journal because it’s like a queue full of Hotel Rwandas. I need to clear those Important Dramas out of there and fill it up with action-adventures and crime thrillers — the stuff I actually like to watch. I am not impressing anybody by filling up my private writing with heavy and sober topics. Even more important, if I am not eager to return to that sober, pain-filled stuff, I am not writing. Seriousness points are not the goal. Enjoying movie night is the goal. Getting your book written is the goal. Your tastes are already perfect. In spite of what an unending conveyor belt of writing books tell me, I am not one to “trust the process.” I do not feel the trust vibes flowing through me. I like questioning assumptions. I advocate devils. I am Critical Analysis Man, the superhero voted least likely to be asked to ribbon-cut at restaurant openings. That’s not to say I don’t come around on things in the fullness of time. I permit myself to become convinced. I allow my suspicions to evolve into convictions once enough calendars have flitted by. So when I write, I don’t enter a state of writerly bliss. I don’t achieve flow. I hammer every word from stone and am conscious of every blow on the way down. I can’t trust my own thoughts, ephemeral and newly-born as they are. It goes against my normal critical mode of hunting for doubts and errors. I am uncomfortable with the speed of trust. I like brakes and rumination and Googling everything. I like fact-checking. I like being right. Given that I write for a living, that is not terrific. I’ve spent time writing blog posts about the dangers of perfectionism. Here’s a secret: they’re written with my own bad habits in mind. I’m excessively familiar with the incompatibility of self-criticism and psychological flow. Wanting to be right is not all bad — it’s just that new prose needs a gentle caretaker. It can’t hold up to the glaring ultraviolet of a critic’s gaze. And writing a novel isn’t a process of conjuring up a few perfect sentences. It’s the psychological equivalent of about fifty marathons. It’s the stringing together of thousands of more-or-less handsome sentences and then subjecting them to a handful of major overhauls. That takes breaking through the paralyzing basilisk gaze of the inner critic — not just once, but over and over and over again. What’s the solution? What’s the trick? What’s the magical pill? Ain’t one. Use whatever tricks you’ve got — all of them, singly and woven together into a quilt of self-encouragement. But here’s a hint. What’s the one thing that always overcomes fear? It’s love, so try remembering what you love about what you’re writing. Kindle your love for your protagonist, and let her in turn kindle excitement in you. Perfectionism is the anti-love. The critical eye is bored by eagerness, and tends to nod off to sleep when your emotions become roused. Let it have its rest. You don’t need to “trust the process.” If you’re like me, phrases like that just set off all my alarms and no work gets done. Instead of trying to turn off negative thoughts, chase positive ones. Go after what gets you excited. When you frost a cake — warning, metaphor in progress — you don’t make it beautiful first. You don’t form attractive little swirls or make sugar roses to put onto the bare cake. You don’t put ripples in the sides or create little waves and peaks on the top. Not yet. That comes later. 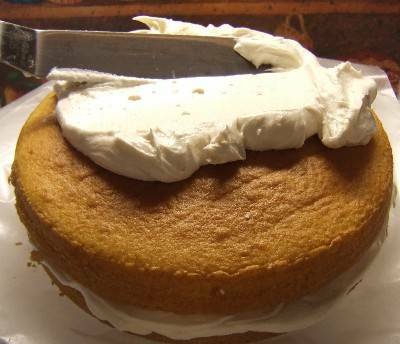 The FIRST step is to slather on a rough layer of frosting. There’s no real technique to it. You just dump a big portion of the stuff out onto the cake and mush it down roughly. Even professional chefs do this. You just blop it on there. Blop. Mush. Smear. You get all the frosting on there first, and then you go back and start smoothing it out. Then you make your swirls and your ripples and your professional-looking sugar roses. I’ve always had a hard time with the “inefficiency” of writing a rough draft. Deep down, no matter how much I tell myself otherwise, I always want to write it perfect from the get-go, so that I don’t have to revise. The error in my thinking is my assumption that writing it “perfect” is in some way efficient. But the frosting metaphor makes it clearer to me. If you try to “frost it perfect,” you WILL create re-work for yourself. You’ll have to overwrite and demolish the stuff you worked so painstakingly on, in the course of frosting the whole cake. It just makes logical, obvious, boneheaded sense to frost it roughly first, and then do the fancy stuff once that’s done. Plus, of course, writing painstakingly is PAINSTAKING! It’s not fun! So I find reasons not to do it. I get all caught up in the anxieties of it all, and I have an awful time during my writing sessions, and then I don’t look forward to it. It’s because I’m trying to write a story made out of perfect little sugar roses. It doesn’t work. Slather. Dump. Get your frosting out there. Make a mess. Have fun with it. Plot and character are closely linked, and the bridge between them is a GOAL. Ever had one of those dreams where you’re late for something (late for school, late for work, late for the bus) or you’re running away from something (running from a disaster, running from monsters, running from an enemy), but your feet just don’t seem to move? Your muscles respond like you’re moving through a Chuck E. Cheese’s ball pool full of corn syrup: a slow motion slog. Everything you do to try to get ahead just gets you further behind, closer to drowning, closer to crisis. Every solution transforms into a further monstrous obstacle. The distance to your goal seems unconquerable, thanks to the legion of nightmare-problems thrown in your way. Goals are the engine of the plot. Present your protagonist with a goal — a goal he desperately, passionately craves — but don’t gift-wrap that goal and leave it on his front porch. Hurl that goal into the invisible distance, and set up a string of obstacles in the way. No free rides. Make a list of dozens of potential ways that your story can prevent him from covering that distance. Get mean. Get freaking unfair. The less lucky your hero is, the more it can endear him to your audience. And then write it — write him into that mire. Watch him work to overcome them one by one, but then show how he just keeps climbing his way into the next disaster you had waiting for him. Finally, once he seems to be within reach of that goal — once everything seems to be finally working out for him, his dreams are finally being realized, and he’s breathing a well-earned sigh of relief — bust it out. You know — IT. The worst obstacle, the most brutal one of all, the one that you saved for last. Throw it at him and let the final reckoning unfold. Explosions. Fireworks. The possibility that he will never accomplish that fervently-held goal, and yet the reality that there’s no way to turn back, no comforting old life to return to. The blackest, most dire moment of all, in which he could gain it all or lose it all. That means that choosing the goal is very important. You probably have a vague goal for your protag now. But how do you know if it’s good enough? Ask yourself what makes the character take action. Think of her, and then start poking and prodding at her. Take something away from her. Does she react? Then it wasn’t a good enough obstacle. So take away something more dear. Does that get her riled up? Ooh, good, you’re getting closer. Keep going. What would make her give it all away? What would make it clear to her that there’s no going back to the way things were? What would make her risk everything, put everything on the line, in order to achieve it? What would make her sacrifice her job, her position in society, her most cherished possession, the opinions of her peers, the love of her family? What’s the thing she desires most — and relatedly, what does she fear the most? What knocks her out of complacency, so that she has to do the unthinkable in order to achieve her most fundamental desires? What is the thing she would gladly die in order to accomplish? That’s your protagonist’s goal. Find it, and then deny it, and you’ve got yourself a plot. The middle of your story is a chain of actions and reactions. The hero tries to accomplish some goal, but there keep being obstacles in the way. Every obstacle he overcomes must lead him to a new one, and usually, it’s a worse one. The hero keeps being frustrated at every turn, but he can’t back out. He wants to find solutions, but you’ve set it up so there’s no easy answers. He’s forced to press on, chaining together attempts to reach his goal while things just get worse and worse. One way to set up this chain of actions and reactions is by forcing bad choices. The hero is presented with two or more options, but each one is going to make things worse for him. 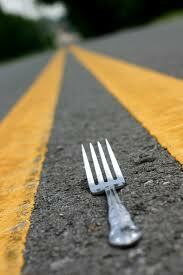 There’s a fork in the road, but no matter what he chooses, he’s just going to get deeper into trouble. Be sure to emphasize for the reader what the dire consequences would be for each option. Tell the reader the stakes. Example 1: A lawyer is trying to win a case for his client, a suspected murderer. There’s piles of evidence connecting his client to the murder, and no way she’s going free. He can either have his client plead guilty, in which case she’ll rot in jail and maybe even be executed; or not guilty by reason of insanity, in which case she’ll be torn from her family, disgraced, and locked away with lunatics. Example 2: A kid lies to her mom and goes somewhere she’s not supposed to go — to an abandoned house. While she’s there, she learns a dangerous secret that involves her family. She can tell her mom about it, in which case she’ll get in trouble for lying and for disobeying her mother. Or she can keep it a secret, in which case there might be great danger for her family. In chess, a powerful tactic is known as the “fork.” Essentially it’s forcing your opponent into a bad choice. You move your bishop in such a way that it’s either going to take your opponent’s knight or your opponent’s rook. The choice is up to your opponent, but either way, he’s going to be closer to losing. It’s a good strategy for winning at chess, and a great strategy for making things worse for your protag and more thrilling for your reader. What bad choices can you force your hero into? There are plenty of ways to improve your technique and your craft of writing. There are books everywhere on the topic. And mostly you get better just by doing it a lot. But when it comes down to it, there aren’t any commandments for writers. Get in there. Write something that makes you tingle. Don’t worry about the universe of critics you’re dreaming up. They don’t exist, and even if they do they don’t matter. Everything’s up to you. The great writers of history had no more weapons than you have right now; they just put in the time. There’s no secret manual. There’s no code of regulations or referees to blow the whistle when you’re doing it wrong. There’s only one thing that counts: did you finish it? It’s all a matter of sitting down and doing the work. I always try to look for methods, tools, techniques to improve my writing. I can learn to write dialogue better, or construct a scene better, or write a better ending. But if someone tells me “always” or “never” I ignore it. If it feels right, I write it. Sometimes even if it feels wrong, I write it. There’s time to revise later. Get it out there. No roadblocks. In normal society, we have to follow rules. But you’re a writer — that means you’re a little bit of a badass. 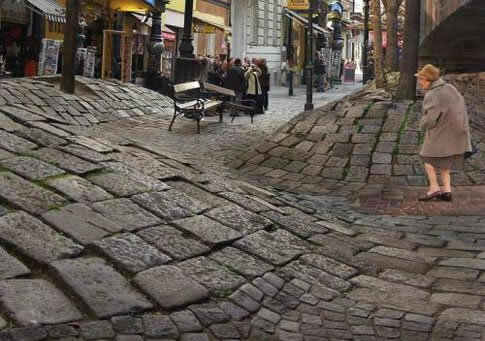 You get to plow ahead where others fear to tread. Don’t let imagined rules hold you back. Thanks to http://www.advicetowriters.com/ for the quotes.